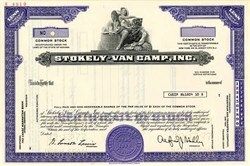 Beautiful engraved specimen certificate from the Stokely-Van Camp,Inc dated in 1977. This historic document was printed by Security-Columbian Banknote Company and has an ornate border around it with a vignette of an allegorical woman sitting in front of a group of tall buildings. This item has the printed signatures of the Company's President and Secretary and is over 31 years old. Van Camp's is a brand of canned beans owned by ConAgra. It has for some time been the best selling brand of pork and beans in the United States. The brand originated in 1861 in the Indianapolis grocery store of Gilbert and Hester Van Camp, who canned fruits and vegetables for their own shop. They obtained a U.S. Army contract during the American Civil War to can and ship pork and beans to the troops. Their son, Frank, is credited with the development of the modern canned pork and beans recipe and went on to found Van Camp Seafood. 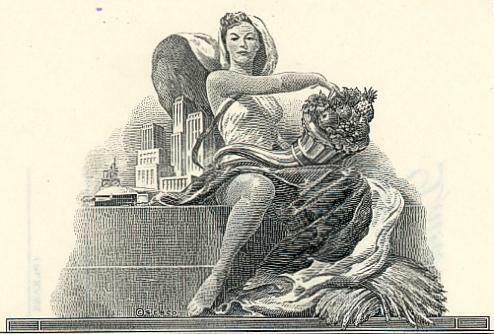 The firm is considered to have been a trend-setter in the canned foods industry, and by 1909, Van Camp's was the dominant vendor of pork and beans. In 1933, it was acquired by James and John Stokely, who operated the Stokely canned tomato company in Newport, Tennessee, forming Stokely-Van Camp, Inc. In 1983, the brand passed to Quaker Oats when it purchased Stokely-Van Camp. Quaker Oats, in turn, sold the brand to ConAgra in 1995. Over the years, a number of canned goods have been sold under the Van Camp's name, but as of 2005 it only sells canned cooked beans, including baked beans, butter beans, kidney beans, a vegetarian variant of its pork and bean recipe and "Beanee Weenee" - a mixture of beans with slices of hot dog made of beef and chicken in a tomato sauce.